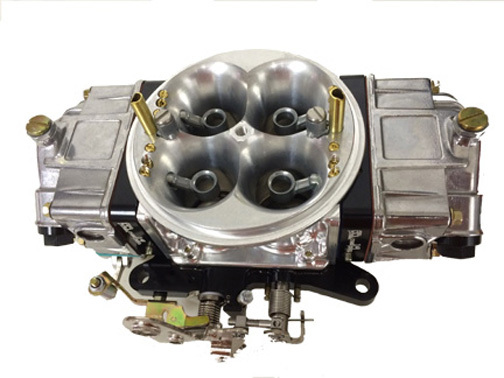 Alcohol has become a very popular race fuel to use with a Holley® carburetor. The big problem is the fuel supply requirement using alcohol. The fuel requirement is twice the amount needed with gasoline. A 700 HP engine consumes 700 pounds of fuel an hour when operating at full throttle. Simple math tells you that no electric and/or mechanical fuel pump will handle this requirement. The electric and 6 valve mechanical pumps have excessive high idle fuel pressure which can cause flooding and rich conditions at idle and part throttle but they cannot keep up with full throttle fuel demand. The solution to the problem is a fuel pump where the pressure is low (3-5 psi) at idle then increases with engine RPM and the pressure is fully adjustable to your needs. is low when doing a water burn out and staging and does not have the high fuel pressure spike that is common with electric pumps. With an 800 HP engine it takes less than 1 HP to operate this pump. Also, there is no drain on the battery. 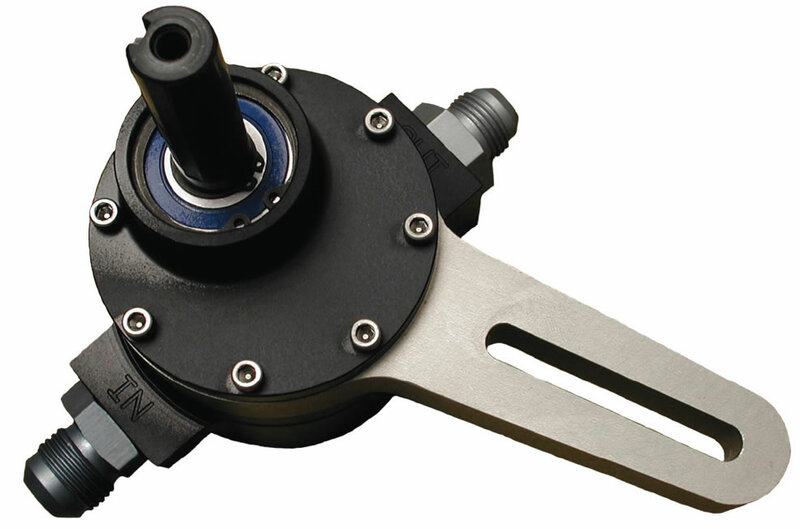 At BLP Racing Products we have developed 2 versions of belt driven fuel pumps. One features an internal fuel by-pass system that enables the user to regulate and adjust the fuel pressure without having to use a separate by-pass valve and a return line to the tank. The second version is a fuel pump with no internal regulator and can be used with a BLP 7491 fuel by-pass regulator or the installer can use their own by-pass system. Doug Learned and his staff at Intercity Manufacturing Incorporated manufacture the pump component parts. BLP then assembles and tests the pumps in-house. The pumps are available in 4 different gear sizes .400”, .500”, 600”, and .700” thick gears. By using different thickness gear wear plates the same body can be used for all 4-size gears. This gives us the option of changing pump volumes by just changing the gears and wear plates. WHICH FUEL PUMP IS BEST? In our opinion it is always best to use a –8 return line with a belt driven fuel pump. This type fuel return system handles fuel spikes better than an internal by-pass type pump. It also keeps the fuel cooler when using gasoline. However, having said that, BLP builds and sells more adjustable, internal by-pass fuel pumps than we do the return line style fuel pumps. The reason for that is they are simple to plumb and easy to adjust. Used in the right application and maintained properly they are virtually trouble free. Providing that you use the proper return regulator these fuel pumps can be used in any application. These fuel pumps by-pass the excess fuel internally to the low-pressure side of the fuel pump. The pressure is adjustable at the fuel pump. No regulators of any kind are required or recommended. • Do not use in circle track application when using gas. It works fine with alcohol in any heat condition, but vapor lock can occur when using gas as a fuel. • Size the pump correctly and do not use any larger pump than necessary. Bigger is not better. • The internal by-pass type pump has to have the fuel inlet line lower than the pump. For example, if you run a modified that has to run the fuel line up high on the chassis then you need to run an external by-pass pump. The validity of advertised fuel pump volumes is only as accurate as the method used for testing. In other words, a fuel pump will show more volume if it is gravity fed with no outlet restriction than if the pump had to lift the fuel and maintain a constant pressure. This holds especially true with a mechanical fuel pump. Example: a mechanical pump may pump 108 gallons per hour at 1 pound of pressure but only 60 gallons per hour if it had to maintain 5 pounds of pressure. We test and flow our pumps in a real world environment. To simulate racing conditions we lift the fuel 18”, pump it through a 1/2” line and maintain race condition fuel pressure. We classify our fuel pumps by the gear thickness and we have (4) different gear sizes to choose from. If you compare the BLP fuel pump to a typical fuel injection pump such as a Hilborn or Enderle then use this as a volume comparison. A BLP .500 wide gear pump will handle most carburetor fuel volume needs. Installing the correct volume fuel pump is very important. Bigger is not always better and if the pump has to by-pass too much fuel then you will have problems with fuel spike. Contact BLP for the correct fuel pump application.